This post shows how to implement CNTK 106 Tutorial in C#. This tutorial lecture is written in Python and there is no related example in C#. For this reason I decided to translate this very good tutorial into C#. The tutorial can be found at: CNTK 106: Part A – Time series prediction with LSTM (Basics) and uses sin wave function in order to predict time series data. 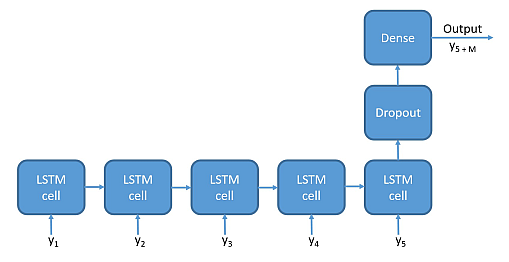 For this problem the Long Short Term Memory (LSTM) Recurrent Neural Network is used. The goal of this tutorial is prediction the simulated data of a continuous function ( sin wave). From N previous values of the y=sin(t) function where y is the observed amplitude signal at time t, prediction of M values of y is going to predict for the corresponding future time points. The generateWaveDataset takes the periodic function,set of independent values (which is corresponded the time for this case) and generate the wave function, by providing the time steps and time shift. The method is related to the generate_data() python method from the original tutorial. They are generated by splitting the dataset generated by the above method. The following splitData method splits the original sin wave dataset into three datasets. As specified in the original tutorial: "Specifying the dynamic axes enables the recurrence engine handle the time sequence data in the expected order. Please take time to understand how to work with both static and dynamic axes in CNTK as described here", the dynamic axes is key point in LSTM.